~I have collected cars for 35 years. This is one of the fine classics from my personal collection, see others at www.gccc.us This is # 1 of a limited productions of 100, so it's the First Continuation Ronale (Elanor spelled Backwards) A Florida company took 2005 New Ford Mustangs and converted to the Elanor look and beefed up the engine to around 450HP.Is there anybody out there into classic cars that has not heard of Elanor??? 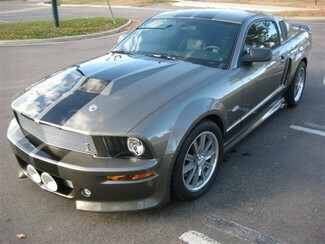 An Elanor look in a newer Mustang with all the Safety and comfort features you find in newer cars. A Blast to ride and drive in. This car has vehicle # 1 representing the first Elanor conversion that rolled out their door. Very low miles.